Valentine’s Day is all about the nostalgia for me. It’s represented by handmade cards, usually made from doilies and construction paper, and conversation hearts. You know what I’m talking about. 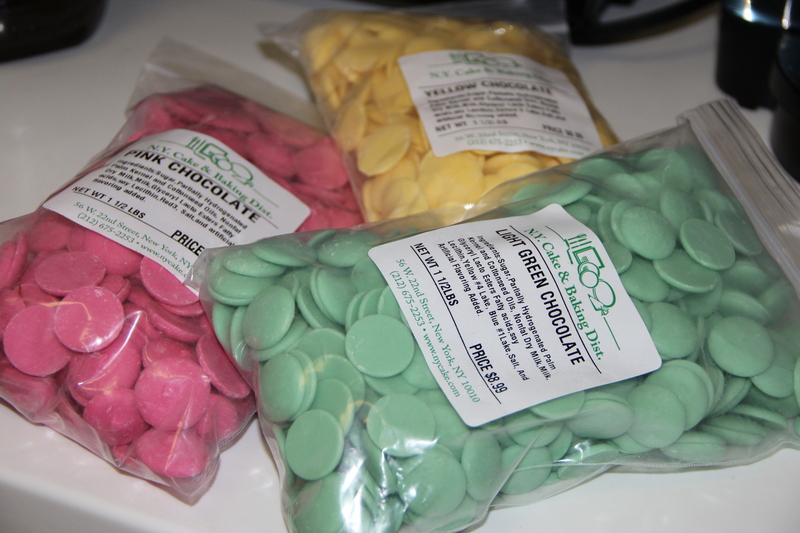 Those little heart shaped, pastel colored candies with adorable sayings written on them? You know the ones that didn’t taste all that great but you ate them anyway? Yea, those things. Ever wonder how such a mediocre candy became the sugary symbol of a whole holiday? Well, I do. And since I couldn’t figure it out, I decided to give them a makeover. Thinking outside the box, of candy that is, I decided these pasty pastel pieces need a serious upgrade. Everyone loves cake and most certainly everyone loves chocolate, and it’s a known fact that everything on a stick tastes better. So cake pops seemed like an obvious choice. The best part? Other than the taste of course…By making your own conversation hearts you control the conversation. Have something to say? Write it in edible ink. Cause nothing says I love you like..well, a heart shaped dessert that says I love you. Bake the cake as directed on the box, using a 9×13 in cake pan. Let cool completely. 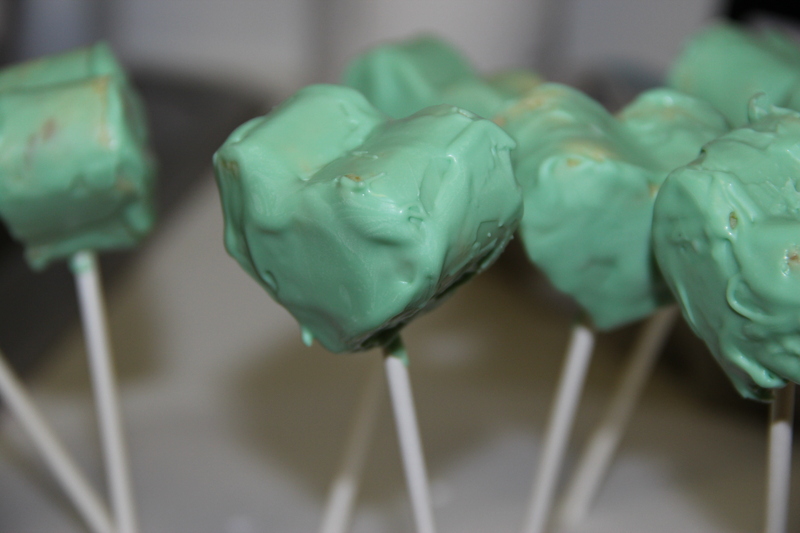 Once the cake is cooled, get organized and set aside a few hours to crumble, roll and dip the cake pops. 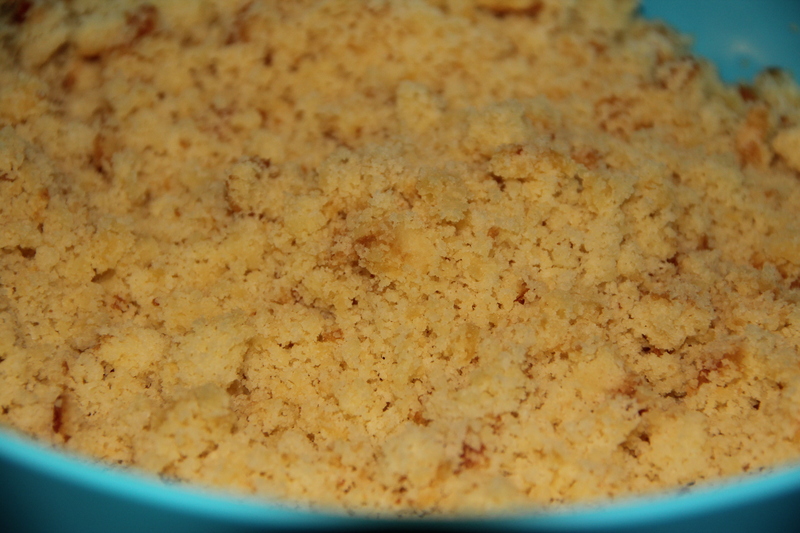 Crumble the cooled cake into a large mixing bowl. This is the fun part, because you get to use your hands to crumble! Make sure the cake is really crumble, no large pieces of cake please! 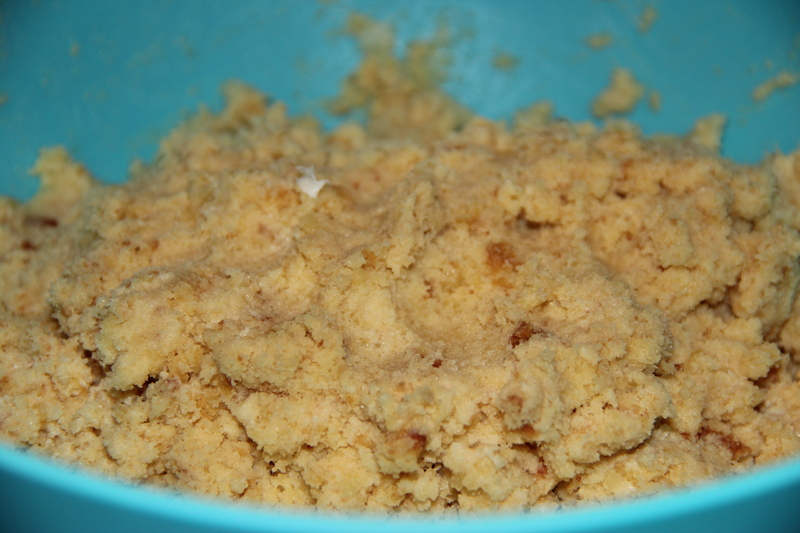 Add 3/4 of the container of frosting to the bowl of crumbled cake and mix until incorporated. You can use your hands (the fun way) or the back of a metal spoon. *Don’t add the entire container of frosting. If you do, the cake balls will be too moist. Cover a baking sheet with parchment paper. Press the cake mixture into the pan in an even layer. Cover with another sheet of parchment paper and then place into the freezer for 15 minutes, or in the refrigerator for a few hours. Once thoroughly cooled, remove and get ready to cut! Prepare another baking sheet with a layer of parchment paper. 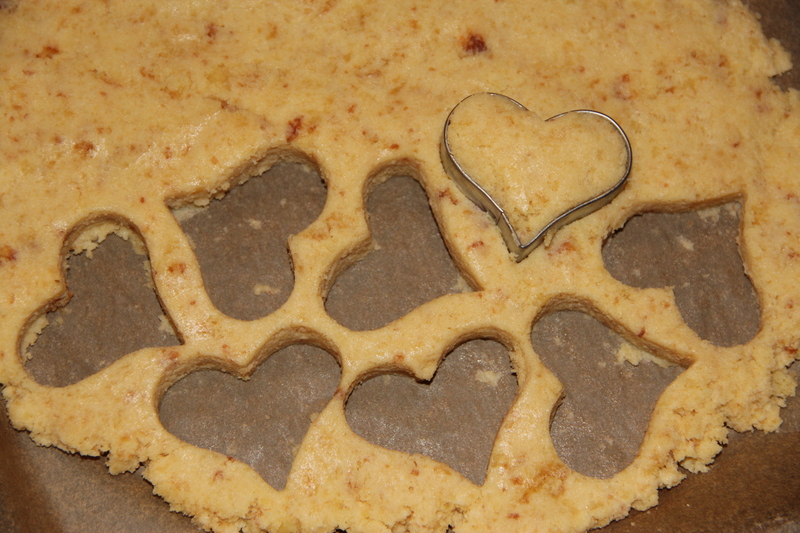 Grab your heart shaped cookie cutter and get cutting! Cut out hearts. Make sure the heart are thick enough to hold a lollipop stick. They should be about 1 1/2 inches thick. If you need to add more cake mixture to the heart, now is the time! Once the heart is cut out, place it on the second baking tray. Continue until your finish the cake mixture. If the mixture becomes sticky, place back into the freezer for a few minutes and then continue. Once all the hearts are cut out, place into the freezer for 15 minutes to firm them up again before dipping. Once they are firm, transfer them to the refrigerator. Remove a few at a time for dipping, keeping the rest chilled. Melt one color of candy at a time in a microwave safe plastic bowl, following the instructions on the packages. The coating should be about 3 inches deep for easy dipping. 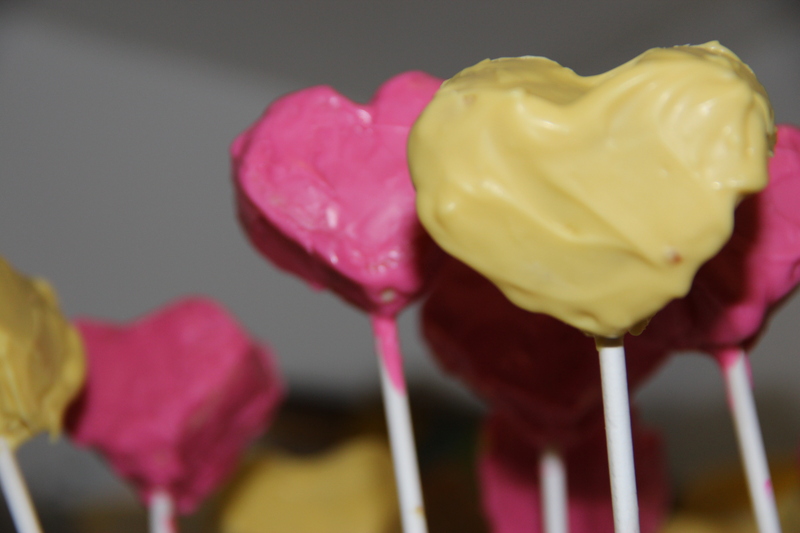 One at a time, dip about 1 1/2 inches of the lollipop stick into the melted candy coating, and insert the stick straight into the bottom of a heart shaped cake, pushing it no more than halfway through. 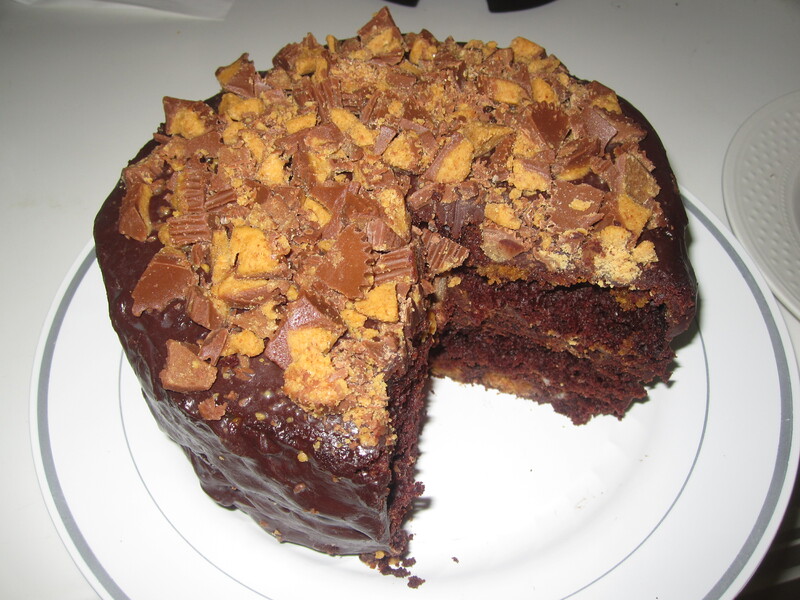 Dip the cake into the melted coating and tap off an excess coating. Let the pops dry on the styrofoam block. 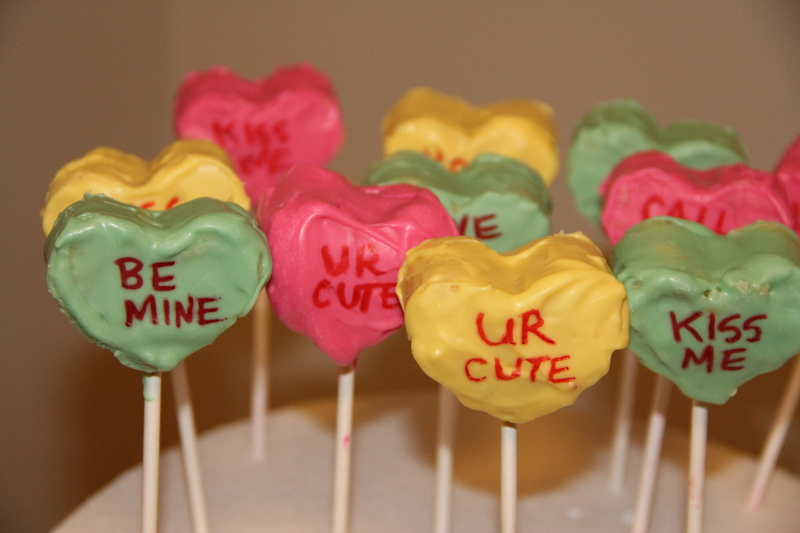 When they are completely dry, use a red edible ink pen to write notes on one side of each cake pop. P.S. If you have extra chocolate, grabs some Oreos and pretzels and get dipping! I know you expect to learn a few things from this Bite-Sized Blonde, but I bet vocabulary isn’t one of them. Well, I have a word for you today. Gradation. No, it’s not SAT prep time, although who knows if I would have ever discovered some of my favorite words without said preparations. Gradation is our word today because it’s an underlying theme what you’re looking at. Gradation is the gradual passing from one shade to another, and in this case, from light pink to dark pink. I told you I was a girly girl right from the start, so it should come as no surprise to you that my birthday cake was pink. Oh, did I forget to mention that it was my birthday? This Bite-Sized Blonde just got a year older and what better way to indulge then with a great cake. A milestone birthday is meant to be distinguished. While other cakes have been sufficiently delicious in years past, I knew a bigger and better cake was in order this year. 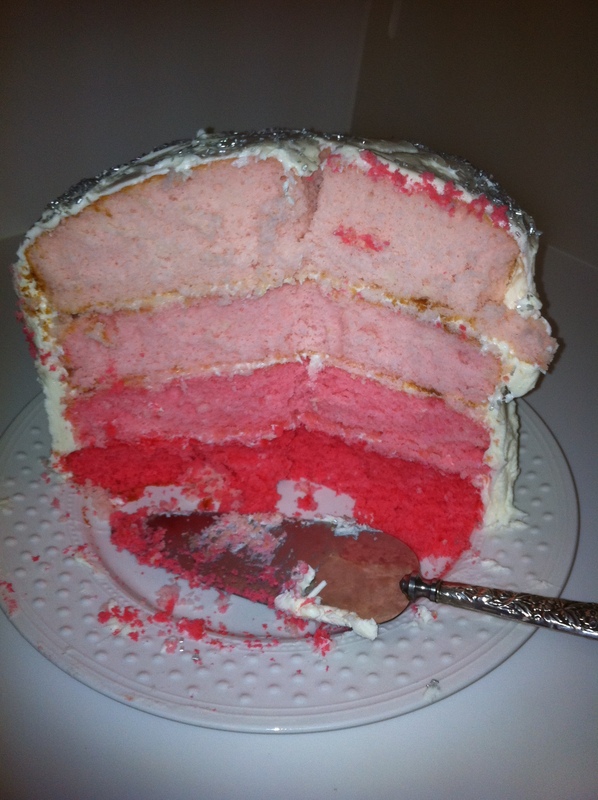 No ice cream or cookie cake for this girly girl, only the biggest, pinkest cake ever created. 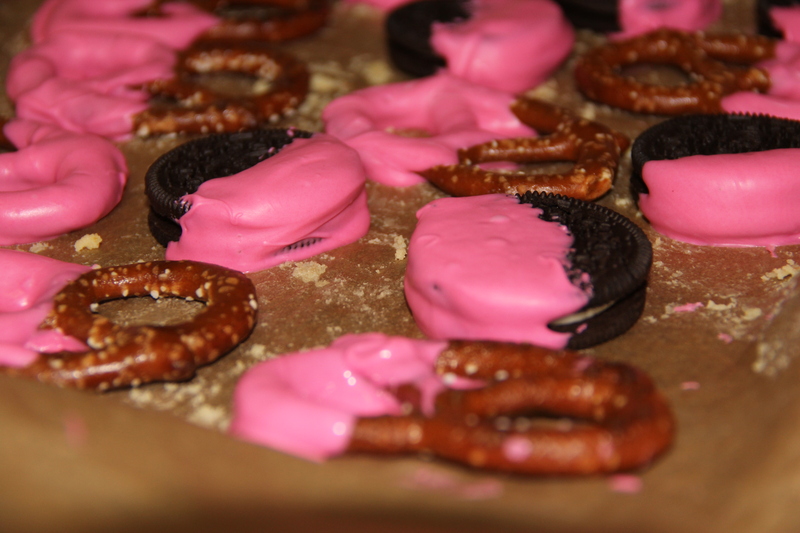 Like Frankenstein, but pink and delicious. This dramatic cake fades from dark pink to light pink, and the gradation doesn’t stop there. 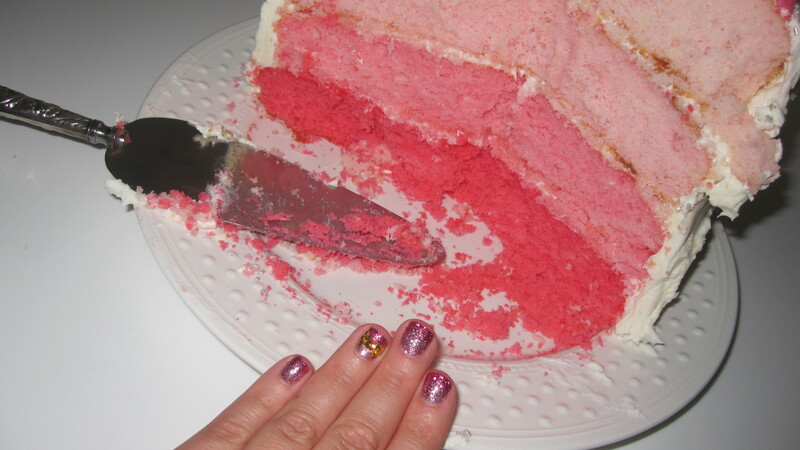 I got a pink glitter gradation manicure to top it all off for my perfect pink party. I swear I turned 25 and not 12. I might be Bite-Sized, but my celebration was anything but. 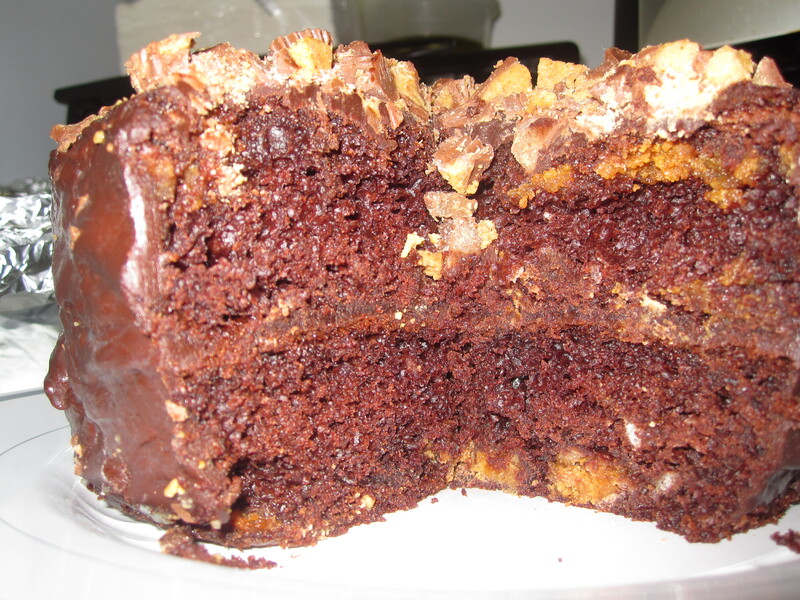 This cake is a four layer cake, so with 2 boxes of cake mix, you are going to make 4 separate cakes. Pre-heat the oven to 350 degrees. Spray four 8 inch cake pans with cooking spray and line each with parchment paper. This will make removing the cakes very easy! Open one box of mix. Follow the directions to make the batter. Then, separate the batter into two different bowls. Add 2 drops of red food coloring to one of the bowls of batter and mix to incorporate. Pour the batter into one of the cake pans and pop it into the oven! Then, add 5 drops of red food coloring to the other bowl of batter and mix to incorporate. Once the batter is sufficiently mixed, pour it into a cake pan and pop it into the oven. Then, open the second box of cake mix and follow the directions to make the batter. Separate the batter into two different bowls. Add 8 drops of food coloring to one bowl and mix to incorporate. Pour this batter into a cake pan and pop in the oven. Add 15 drops of food coloring to the last bowl and mix to incorporate. 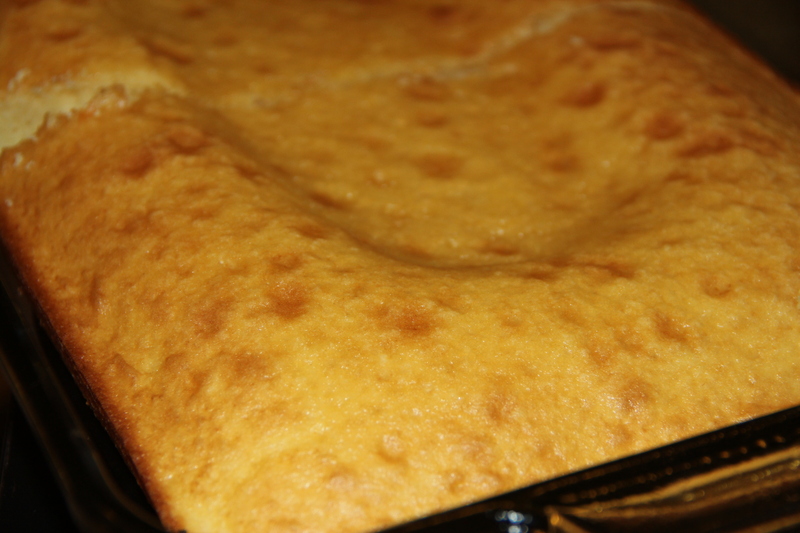 Pour batter into a cake pan and place in the oven. Bake each cake for approximately 32 minutes or until firm and slightly golden. Don’t worry about the cake browning, the frosting will cover it. Let each cake cool before removing from the pan. Then, wrap each cake in clear plastic wrap and refrigerate for about 3 hours. Once the cakes are cool, remove from the refrigerator. Place the darkest pink layer on a cake stand. 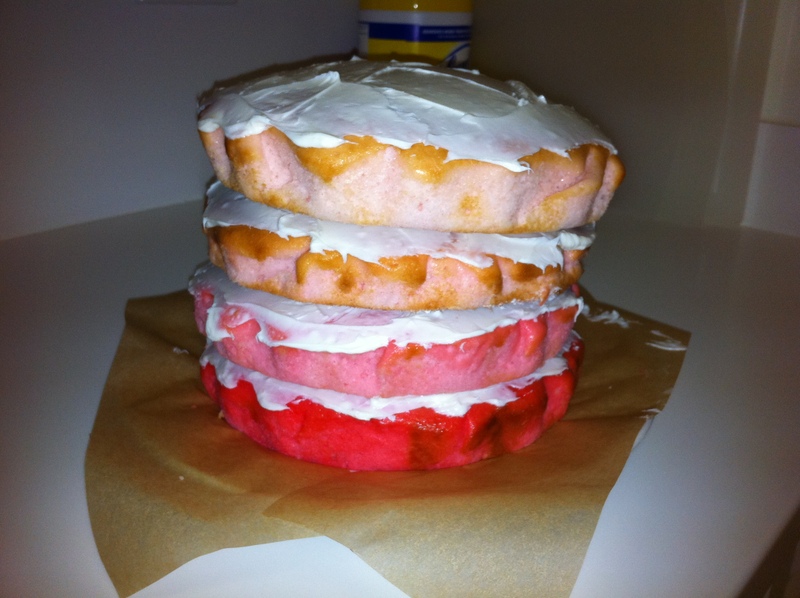 Cover the top with frosting and then place the second darkest pink layer on top of it. Repeat until all the layers are assembled. If you are looking for a polished, professional looking cake, shave down the sides of the cake using a perforated knife. If you would like a homemade look to the cake, leave as is. Frost the sides of the cake and decorate as you wish! 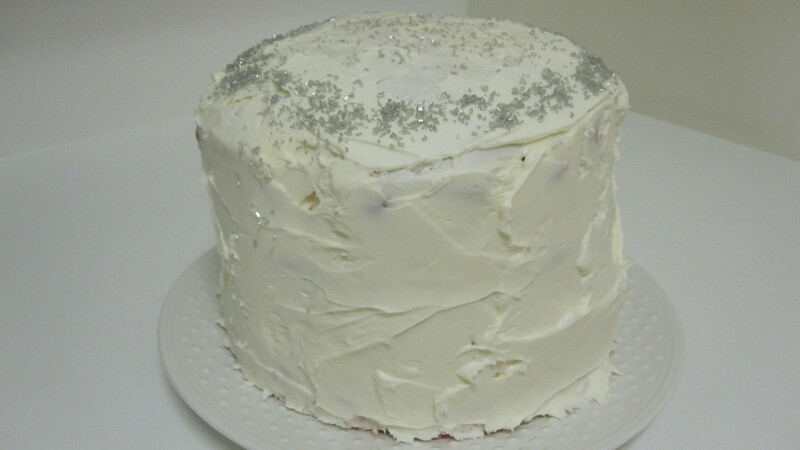 I used silver sprinkles from Williams-Sonoma. I am a lucky, lucky girl for many reasons, the most important of which is because of the loving family and friends that I have. Some people have friends, some have best friends, and some have best friends that become family. I have one of those best friends who is so close that the line between friend and sister has completed blended. By now, you’ve figured out this is going to be a mushy post. Quick, someone give me a cracker for that cheese. Let’s face it, I’m so cheesy I might as well be cheese whiz. But one man’s cheese is another man’s treasure. My best friend, and sister, had a big birthday this week. It isn’t everyday you have a milestone birthday; although, every year should be treated as such. And, for her birthday, I knew I had to bake her the one thing that I have been promising her for years: a rainbow cookie cake. Yes, that’s right…an entire cake made out of rainbow cookies. Now, you may be asking why it’s taken me so long to bake this, or you may be asking why in the world anyone would want such a thing. Well, the answer is simple. The recipe seemed daunting and my girl loves her a rainbow cookie. Well, this Bite-Sized Blonde decided to put her big girl apron on and give this cake a whirl, and guess what…it was easy as pie and as magnificent as a double rainbow. Preheat the oven to 350 degrees F. Line three 9 nine inch aluminum pie pans with parchment paper; this makes it easier to remove the cake. In a large bowl, break apart the almond paste with a fork. 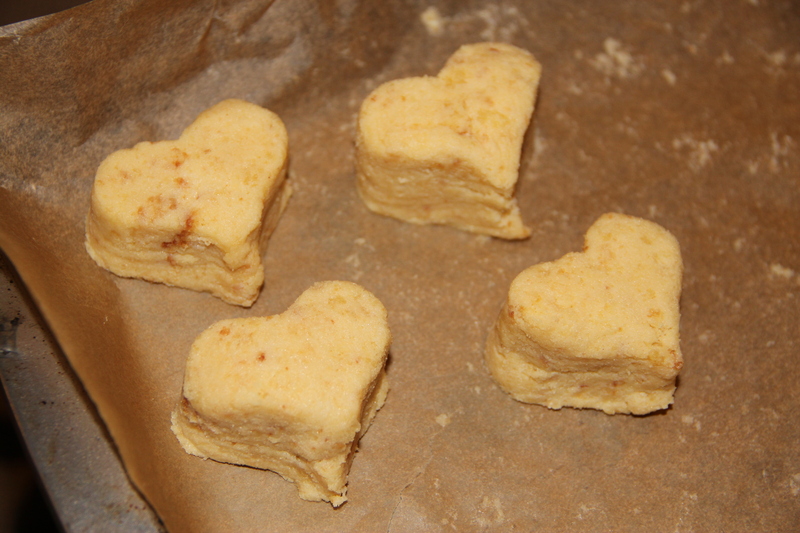 Cream the almond paste together with the butter, sugar and egg yolks. When this mixture is smooth, stir in the flour to form dough; I like to use my hands to do this. Keep in mind, this is dough, not batter, so it will be thick and heavy. In a small bowl, beat the egg whites until soft peaks form. (When you turn your whisk upside down, the peaks are just starting to hold. They’re soft and melt back into themselves after a second.) Fold the eggs whites into the dough and then divide the dough into 3 equal portions. Mix one portion with red food coloring, one portion with green food coloring, and leave one as is. You can use as much food coloring and you like so have fun with this! I used 7 drops of each color. If you are going to use your hands to do this, make sure you are wearing gloves, otherwise you’ll look like you just tie dyed a t-shirt at the art shack at camp. If you don’t have gloves, just use a spatula. Spread each portion of dough into one of the prepared pie pans. The dough is sticky so be patient. The dough must be spread in an even layer in order to cook evenly. Bake each cake for approximately 20 minutes or until lightly browned. After the cakes have had time to cool, carefully remove them from the parchment paper. Place two pieces of parchment paper on a plate. Then, place the green layer of cake down on the parchment paper. Spread a thin layer of raspberry preserves onto the cake. Top with the uncolored layer and then spread a thin layer of raspberry preserves. Cover with the red layer of cake. If your cakes are not even, don’t worry. You can shave off the outside of the cakes with a knife. Then, wrap the cake in plastic wrap. Place a heavy pan or cutting board on the cake to compress it for 30 minutes. After the cake has had time to compress, remove the plastic wrap and top the cake with melted chocolate chips. Refrigerate for at least an hour or until the chocolate has firmed. After the chocolate has cooled, you can remove the parchment paper from the plate, leaving you a nice, clean plate to serve the cake on. Slice and enjoy!